Flashnote Apps for Music Education | Manage and track your music students! Flashnote Derby is an app for your iPhone, iPad, or iPod touch that takes the drudgery of memorizing the notes of the music staff and turns it into a fun and challenging game. Simply select the notes you wish to practice, and it’s off to the races. Identifying notes correctly will urge your horse on to the finish line, while incorrect answers cause you to fall behind. Increase the difficulty by adding more notes and speeding up the race. Before you know it, you’ll be an expert at naming the notes of the treble clef, the bass clef, or even alto and tenor clefs. Any child who can learn to read can also learn to read music. Flashnote Derby makes it fun to learn! Use your acoustic piano or MIDI keyboard to play the correct note. Great for school or studio use! Education pricing available from Apple for qualified academic institutions. Take the 90 second tour! Tap to start the video! Click to start the video! Faster note recognition. Reduce frustration in learning new music. Become a better sight-reader. Experience the joy of being able to pick up new music and play it at sight. Increased enjoyment. Improved skills equals more fun when making music. When music students become frustrated and start asking to quit their music studies, it’s usually not because they no longer enjoy music. It’s because it has become too difficult. They are lacking some basic skills they need to succeed. 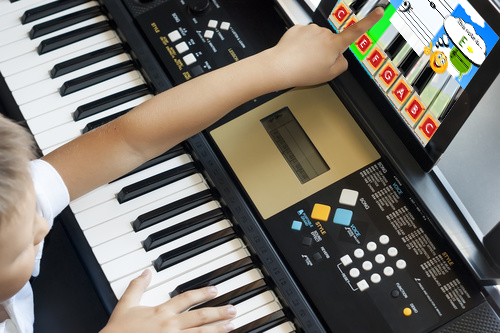 If a child can’t name all of the music notes on the staff instantly, then they need Flashnote Derby. There’s no way to get around the memorization that is required when learning to read music. But there are ways to make it more fun. Any child who is capable of learning and remembering the letters of the alphabet is capable of memorizing the notes on the staff. While there are many challenges to be conquered when learning a musical instrument, the inability to read notes should never be one that holds a student back. Get Flashnote Derby today on the app store. It’s available for iPhone and iPad as well as Android tablets and phones and Kindle Fire tablets.